U.S. Aerospace Founder and CEO Ron Farr has provided nearly 30 years of strong, continuous, hands-on leadership since founding the company in 1986. 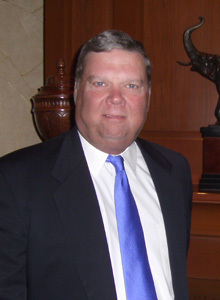 U.S. Aerospace Corp. (USA) Founder and CEO Ron Farr has provided nearly 30 years of strong, continuous, hands-on leadership since founding the Company in 1986. Throughout his 40-year career in aviation aftermarket services, Ron has maintained an unrelenting commitment to safety, quality, reliability, and superior customer service. Ron built and successfully manages USA by capitalizing on his technical knowledge, discipline, team-building skills, and business expertise as well as his passion for aviation – strengths developed through his Fortune 500 management experience and MBA education and through his military service and many flight hours as a licensed pilot on a wide range of aircraft. A classic entrepreneur, Ron learned the “nuts and bolts” of the aviation repair and maintenance business through hands-on experience in all aspects of operations. That hands-on experience started with his service as a United States Marine Corps avionics technician during the Vietnam War, an experience which has also motivated him to continually provide job opportunities to other veterans. After completing his military service and his college education, Ron started his private sector career in the aerospace industry with the McDonnell Aircraft Company, a division of McDonnell Douglas Corporation, where he worked as a Contract Cost Estimator on the F-18A and CF-18A aircraft. He later joined Rockwell International’s Collins Government Avionics Division as Government Contract Manager. In that role, he managed both prime contractor and sub-contractor relationships with all branches of the United States military. His responsibilities encompassed equipment installed on the Boeing B-1B bomber and the Boeing AH-64 Apache helicopter as well as contracts related to ARN-118 navigational sets and the ARC-186 multi-ban airborne radio systems. Recognizing the entrepreneurial opportunities in aircraft maintenance, repair and overhaul (MRO, and specifically in avionics, Ron moved to an avionics and accessory repair company, where his role as a program manager enabled him to manage all aspects of sales and service fulfillment for a variety of both government and commercial customers. This experience was the catalyst that propelled him to start his own company, which ultimately became U.S. Aerospace Corp.
Today, USA has one of the broadest sets of capabilities among FAA 145 repair stations. USA holds Class 1-2-3-4 unlimited ratings for Instruments; Class 1-2-3 unlimited ratings for Radio; and Class 1-2 unlimited ratings for both mechanical and electrical Accessories. USA also has a limited rating for airframe services. USA is one of less than a dozen FAA-certified repair stations with this unique mix of capabilities. Over four decades, U.S. Aerospace has grown steadily and developed a hard-earned reputation for unparalleled quality, technical expertise, and responsive customer service, while developing a worldwide customer base, which includes air cargo carriers, regional airlines, government and defense contractors, commercial carriers, corporate and private jet owners and operators, and other MRO service providers, among others. Ron earned his Masters of Business Administration (M.B.A.) degree from Indiana University’s Kelly School of Business, where he majored in finance and marketing. He also holds a Bachelor of Arts (B.A.) in Business from the University of Memphis. Additionally, Ron has a Federal Aviation Administration certificate (FAA 2417648) and a Federal Communications Commission (FCC) certificate. Ron enjoys both business and personal travel, which enables him to combine his three main personal interests: flying, travel and golf.